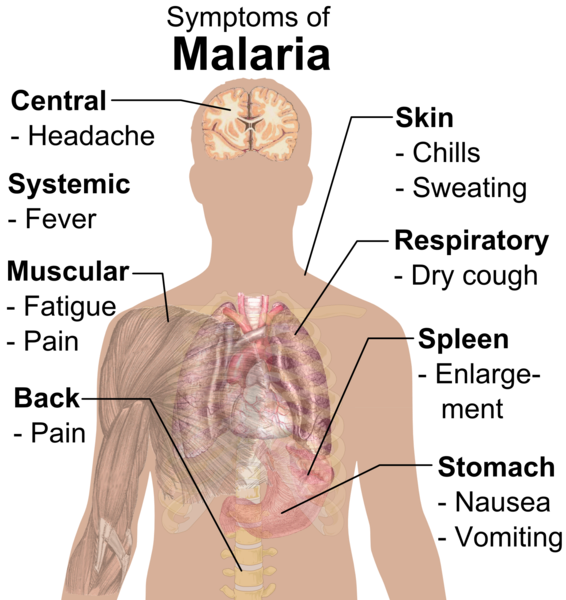 Malaria is a serious infectious disease spread by certain mosquitoes. It is most common in tropical climates. It is characterized by recurrent symptoms of chills, fever, and an enlarged spleen. The disease can be treated with medication, but it often recurs. Malaria is endemic (occurs frequently in a particular locality) in many third world countries. Isolated, small outbreaks sometimes occur within the boundaries of the United States, with most of the cases reported as having been imported from other locations. Malaria is a growing problem in the United States. Although only about 1400 new cases were reported in the United States and its territories in 2000, many involved returning travelers. In addition, locally transmitted malaria has occurred in California, Florida, Texas, Michigan, New Jersey, and New York City. While malaria can be transmitted in blood, the American blood supply is not screened for malaria. Widespread malarial epidemics are far less likely to occur in the United States, but small localized epidemics could return to the Western world. As of late 2002, primary care physicians are being advised to screen returning travelers with fever for malaria, and a team of public health doctors in Minnesota is recommending screening immigrants, refugees, and international adoptees for the disease—particularly those from high-risk areas. The picture is far more bleak, however, outside the territorial boundaries of the United States. A recent government panel warned that disaster looms over Africa from the disease. Malaria infects between 300 and 500 million people every year in Africa, India, southeast Asia, the Middle East, Oceania, and Central and South America. A 2002 report stated that malaria kills 2.7 million people each year, more than 75 percent of them African children under the age of five. It is predicted that within five years, malaria will kill about as many people as does AIDS. 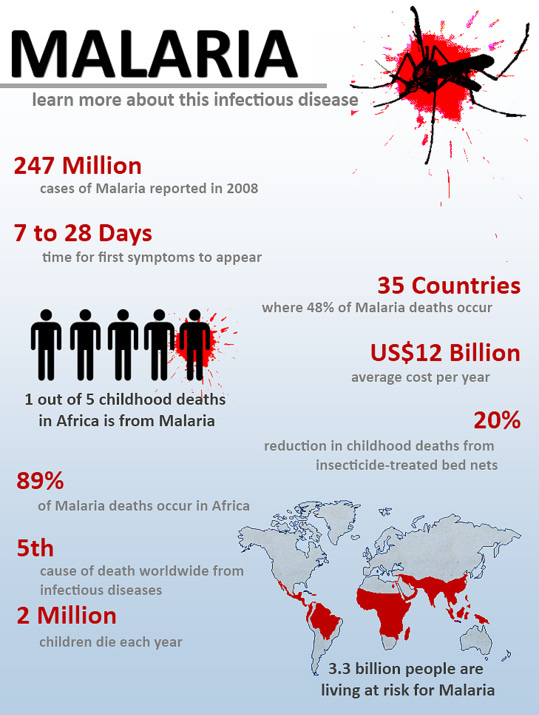 As many as half a billion people worldwide are left with chronic anemia due to malaria infection. In some parts of Africa, people battle up to 40 or more separate episodes of malaria in their lifetimes. 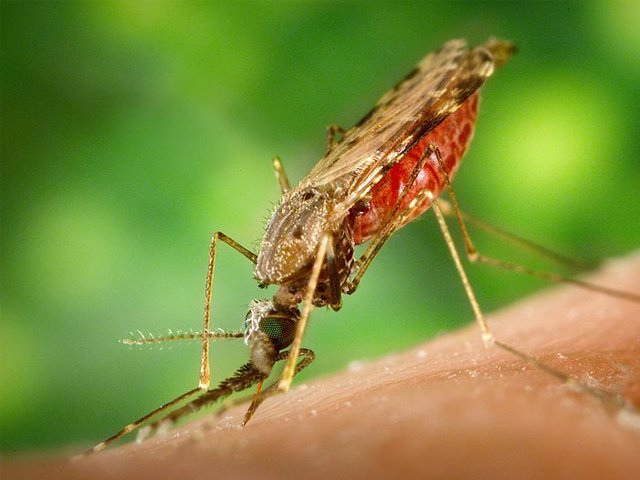 The spread of malaria is becoming even more serious as the parasites that cause malaria develop resistance to the drugs used to treat the condition. In late 2002, a group of public health researchers in Thailand reported that a combination treatment regimen involving two drugs known as dihydroartemisinin and azithromycin shows promises in treating multidrug-resistant malaria in southeast Asia. 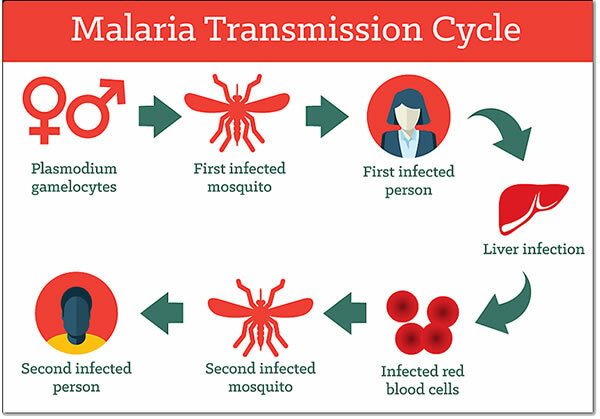 Human malaria is caused by four different species of a parasite belonging to genus Plasmodium: Plasmodium falciparum (the most deadly), Plasmodium vivax, Plasmodium malariae, and Plasmodium ovale. The last two are fairly uncommon. Many animals can get malaria, but human malaria does not spread to animals. In turn, animal malaria does not spread to humans. A person gets malaria when bitten by a female mosquito seeking a blood meal that is infected with the malaria parasite. The parasites enter the blood stream and travel to the liver, where they multiply. When they reemerge into the blood, symptoms appear. By the time a patient shows symptoms, the parasites have reproduced very rapidly, clogging blood vessels and rupturing blood cells. Malaria cannot be casually transmitted directly from one person to another. Instead, a mosquito bites an infected person and then passes the infection on to the next human it bites. It is also possible to spread malaria via contaminated needles or in blood transfusions. This is why all blood donors are carefully screened with questionnaires for possible exposure to malaria. It is possible to contract malaria in non-endemic areas, although such cases are rare. Nevertheless, at least 89 cases of so-called airport malaria, in which travelers contract malaria while passing through crowded airport terminals, have been identified since 1969. The amount of time between the mosquito bite and the appearance of symptoms varies, depending on the strain of parasite involved. The incubation period is usually between eight and 12 days for falciparum malaria, but it can be as long as a month for the other types. Symptoms from some strains of P. vivax may not appear until eight to 10 months after the mosquito bite occurred. The primary symptom of all types of malaria is the “malaria ague” (chills and fever), which corresponds to the “birth” of the new generation of the parasite. In most cases, the fever has three stages, beginning with uncontrollable shivering for an hour or two, followed by a rapid spike in temperature (as high as 106°F [41.4°C]), which lasts three to six hours. Then, just as suddenly, the patient begins to sweat profusely, which will quickly bring down the fever. Other symptoms may include fatigue, severe headache, or nausea and vomiting. As the sweating subsides, the patient typically feels exhausted and falls asleep. In many cases, this cycle of chills, fever, and sweating occurs every other day, or every third day, and may last for between a week and a month. Those with the chronic form of malaria may have a relapse as long as 50 years after the initial infection. Falciparum malaria is far more severe than other types of malaria because the parasite attacks all red blood cells, not just the young or old cells, as do other types. It causes the red blood cells to become very “sticky.” A patient with this type of malaria can die within hours of the first symptoms. The fever is prolonged. So many red blood cells are destroyed that they block the blood vessels in vital organs (especially the brain and kidneys), and the spleen becomes enlarged. There may be brain damage, leading to coma and convulsions. The kidneys and liver may fail. Malaria in pregnancy can lead to premature delivery, miscarriage, or stillbirth. This is true for as long as that human has parasites in his/her blood. Since strains of malaria do not protect against each other, it is possible to be reinfected with the parasites again and again. It is also possible to develop a chronic infection without developing an effective immune response. Malaria is diagnosed by examining blood under a microscope. The parasite can be seen in the blood smears on a slide. These blood smears may need to be repeated over a 72-hour period in order to make a diagnosis. Antibody tests are not usually helpful because many people developed antibodies from past infections, and the tests may not be readily available. A new laser test to detect the presence of malaria parasites in the blood was developed in 2002, but is still under clinical study. Two new techniques to speed the laboratory diagnosis of malaria show promise as of late 2002. The first is acridine orange (AO), a staining agent that works much faster (3–10 minutes) than the traditional Giemsa stain (45–60 min) in making the malaria parasites visible under a microscope. The second is a bioassay technique that measures the amount of a substance called histadine-rich protein II (HRP2) in the patient’s blood. It allows for a very accurate estimation of parasite development. A dip strip that tests for the presence of HRP2 in blood samples appears to be more accurate in diagnosing malaria than standard microscopic analysis. Anyone who becomes ill with chills and fever after being in an area where malaria exists must see a doctor and mention their recent travel to endemic areas. A person with the above symptoms who has been in a highrisk area should insist on a blood test for malaria. The doctor may believe the symptoms are just the common flu virus. Malaria is often misdiagnosed by North American doctors who are not used to seeing the disease. Delaying treatment of falciparum malaria can be fatal. The Chinese herb qiinghaosu (the Western name is artemisinin) has been used in China and southeast Asia to fight severe malaria, and became available in Europe in 1994. It is usually combined with another antimalarial drug (mefloquine) to prevent relapse and drug resistance. It is not available in the United States and other parts of the developed world due to fears of its toxicity, in addition to licensing and other issues. A Western herb called wormwood (Artemesia annua) that is taken as a daily dose may be effective against malaria. Protecting the liver with herbs like goldenseal (Hydrastis canadensis), Chinese goldenthread (Coptis chinensis), and milk thistle (Silybum marianum) can be used as preventive treatment. These herbs should only be used as complementary to conventional treatment and not to replace it. Patients should consult their doctors before trying any of these medications. As of late 2002, researchers are studying a traditional African herbal remedy against malaria. Extracts from Microglossa pyrifolia, a trailing shrub belonging to the daisy family (Asteraceae), show promise in treating drug-resistent strains of P. falciparum. Falciparum malaria is a medical emergency that must be treated in the hospital. The type of drugs, the method of giving them, and the length of the treatment depend on where the malaria was contracted and the severity of the patientís illness. For all strains except falciparum, the treatment for malaria is usually chloroquine (Aralen) by mouth for three days. Those falciparum strains suspected to be resistant to chloroquine are usually treated with a combination of quinine and tetracycline. In countries where quinine resistance is developing, other treatments may include clindamycin (Cleocin), mefloquin (Lariam), or sulfadoxone/pyrimethamine (Fansidar). Most patients receive an antibiotic for seven days. Those who are very ill may need intensive care and intravenous (IV) malaria treatment for the first three days. A patient with falciparum malaria needs to be hospitalized and given antimalarial drugs in different combinations and doses depending on the resistance of the strain. The patient may need IV fluids, red blood cell transfusions, kidney dialysis, and assistance breathing. A drug called primaquine may prevent relapses after recovery from P. vivax or P. ovale. These relapses are caused by a form of the parasite that remains in the liver and can reactivate months or years later. Another new drug, halofantrine, is available abroad. While it is licensed in the United States, it is not marketed in this country and it is not recommended by the Centers for Disease Control and Prevention in Atlanta. If treated in the early stages, malaria can be cured. Those who live in areas where malaria is epidemic, however, can contract the disease repeatedly, never fully recovering between bouts of acute infection. Preventing mosquito bites while in the tropics is one possible way to avoid malaria. 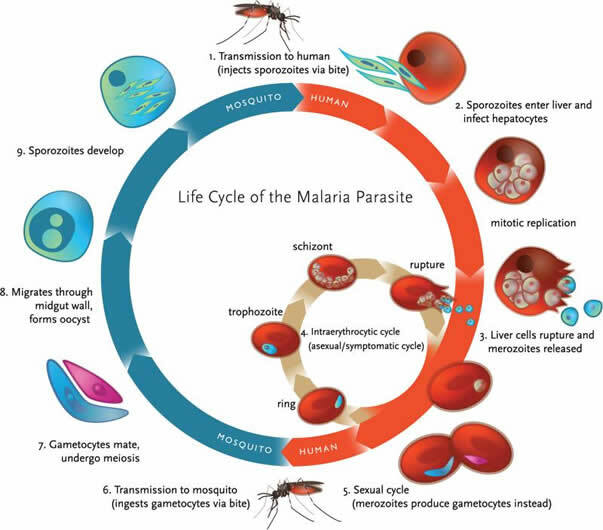 Several researchers are currently working on a malarial vaccine, but the complex life cycle of the malaria parasite makes it difficult. A parasite has much more genetic material than a virus or bacterium. For this reason, a successful vaccine has not yet been developed. A new longer-lasting vaccine shows promise, attacking the toxin of the parasite and therefore lasts longer than the few weeks of those vaccines currently used for malaria prevention. However, as of late 2002, the vaccine had been tested only in animals, not in humans, and could be several years from use. A newer strategy involves the development of genetically modified non-biting mosquitoes. A research team in Italy is studying the feasibility of this means of controlling malaria. Malaria is an especially difficult disease to prevent by vaccination because the parasite goes through several life stages. One recent, promising vaccine appears to have protected up to 60% of people exposed to malaria. This was evident during field trials for the drug that were conducted in South America and Africa. It is not yet commercially available. The World Health Organization has been trying to eliminate malaria for the past 30 years by controlling mosquitoes. Their efforts were successful as long as the pesticide DDT killed mosquitoes and antimalarial drugs cured those who were infected. Today, however, the problem has returned a hundredfold, especially in Africa. Because both the mosquito and parasite are now extremely resistant to the insecticides designed to kill them, governments are now trying to teach people to take antimalarial drugs as a preventive medicine and avoid getting bitten by mosquitoes. Travelers to high-risk areas should use insect repellant containing DEET for exposed skin. Because DEET is toxic in large amounts, children should not use a concentration higher than 35%. DEET should not be inhaled. It should not be rubbed onto the eye area, on any broken or irritated skin, or on children’s hands. It should be thoroughly washed off after coming indoors. Between dusk and dawn, remaining indoors in well-screened areas. Sleep inside pyrethrin or permethrin repellent-soaked mosquito nets. Wearing clothes over the entire body. Anyone visiting areas where malaria is endemic should take antimalarial drugs starting one week before they leave the United States. The drugs used are usually chloroquine or mefloquine. This treatment is continued through at least four weeks after leaving the endemic area. However, even those who take antimalarial drugs and are careful to avoid mosquito bites can still contract malaria. International travelers are at risk for becoming infected. Most Americans who have acquired falciparum malaria were visiting sub-Saharan Africa; travelers in Asia and South America are less at risk. Travelers who stay in air conditioned hotels on tourist itineraries in urban or resort areas are at lower risk than those who travel outside these areas, such as backpackers, missionaries, and Peace Corps volunteers. Some people in Western cities where malaria does not usually exist may acquire the infection from a mosquito carried onto a jet. This is called airport or runway malaria. A 2002 report showed how efforts in a Vietnamese village to approach prevention from multiple angles resulted in a significant drop in malaria cases. Health workers distributed bed nets treated with permethrin throughout the village and also made sure they were resprayed every six months. They also worked to ensure early diagnosis, early treatment, and annual surveys of villagers to bring malaria under control.